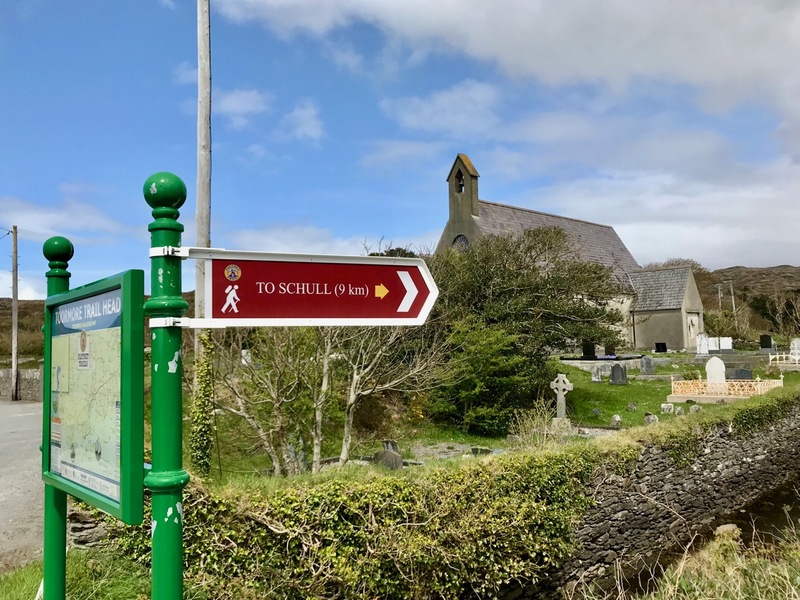 Lowertown, Schull to Toormore: it may seem a rather unadventurous walk: mainly on narrow back roads. 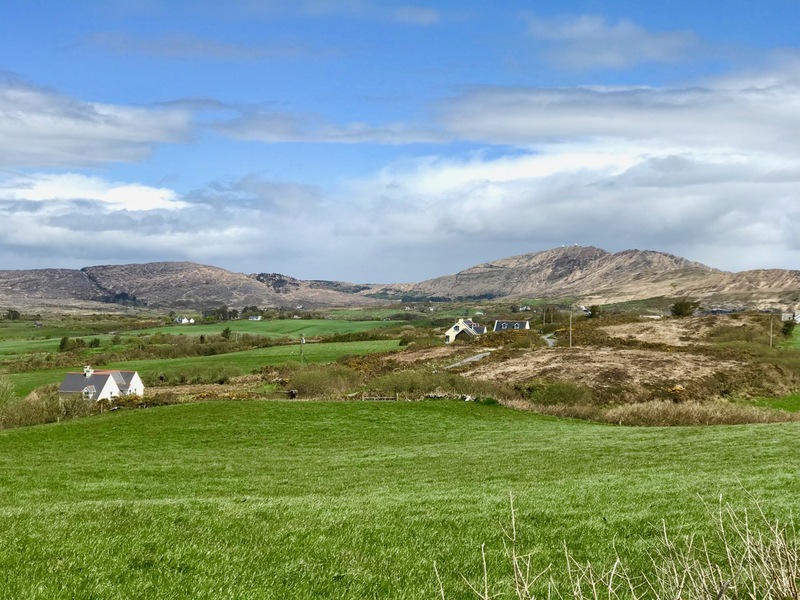 But, on a spring day of scudding clouds and clear air, with distant views from the high ground across to the Sheep’s Head and even beyond, into Kerry, there is stimulation a-plenty to be had from an easy afternoon’s ambling and exploring of places which would be passed by in an instant when driving down to the west of West Cork. 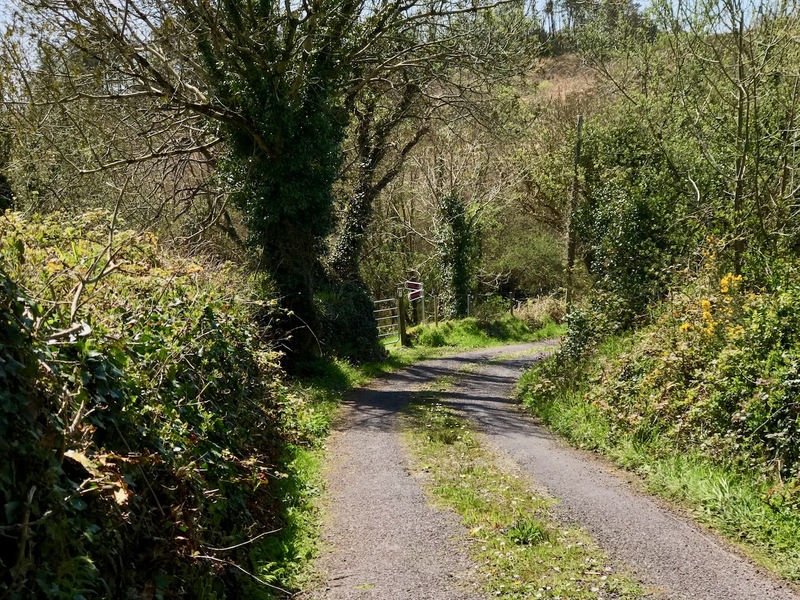 Although largely on tiny boreens, you are unlikely to encounter any traffic: we didn’t see any vehicles in two hours, apart from those parked in the few houses and farmyards on the way. 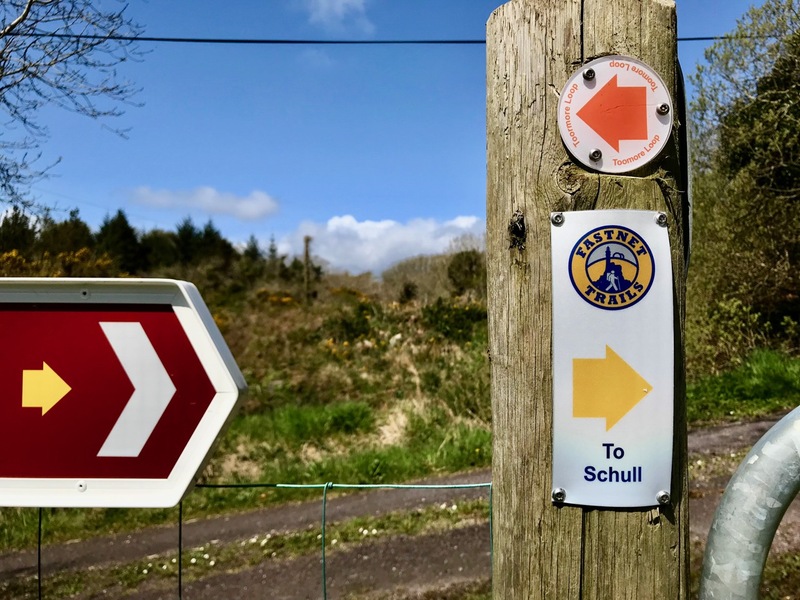 Header – our walk is part of the Fastnet Trails network beyond Schull: in this case the Toormore Loop. 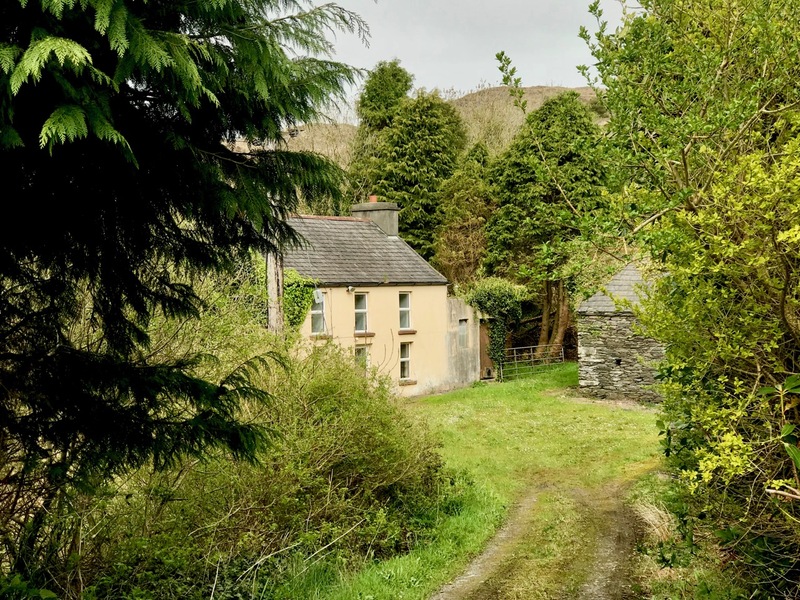 Upper – undisturbed peace on the quiet boreens; lower – we started out at Lowerton, where you will find a fiddler at the ready beside the old dance platform! 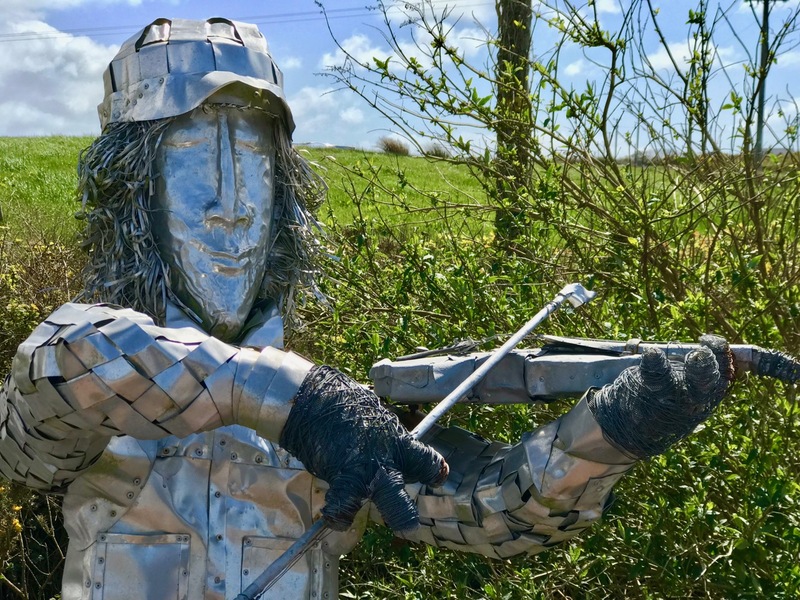 We parked one car beside the church at Lowertown – opposite the site of the old dance platform, celebrated with the sculptures of Susan O’Toole – and the other beside Teampol na mBocht, the little church at Altar, overlooking Toormore Bay. 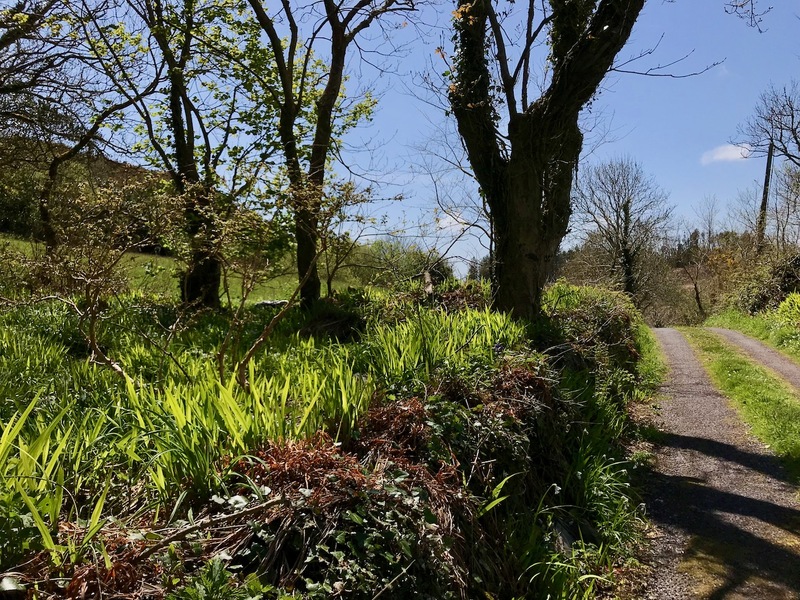 This enabled us to take our time and enjoy every aspect of the route, walking from east to west: in my view always the proper way to walk – following the sun! 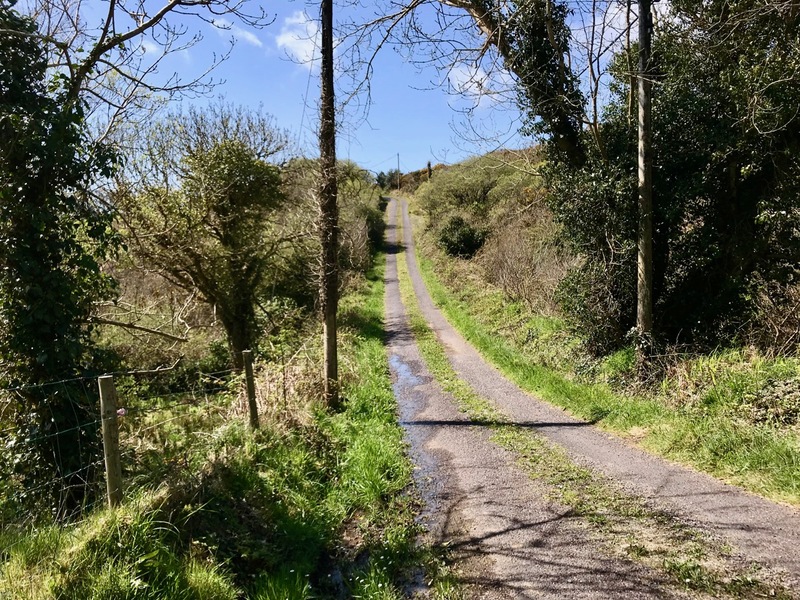 I should point out that the route we took – around 5 kilometres – is only a part of the full Toormore Loop which is itself one of an excellent comprehensive system of Fastnet Trails which has been put in place in recent years. The little road climbs up and over hills and down through valleys and glens. 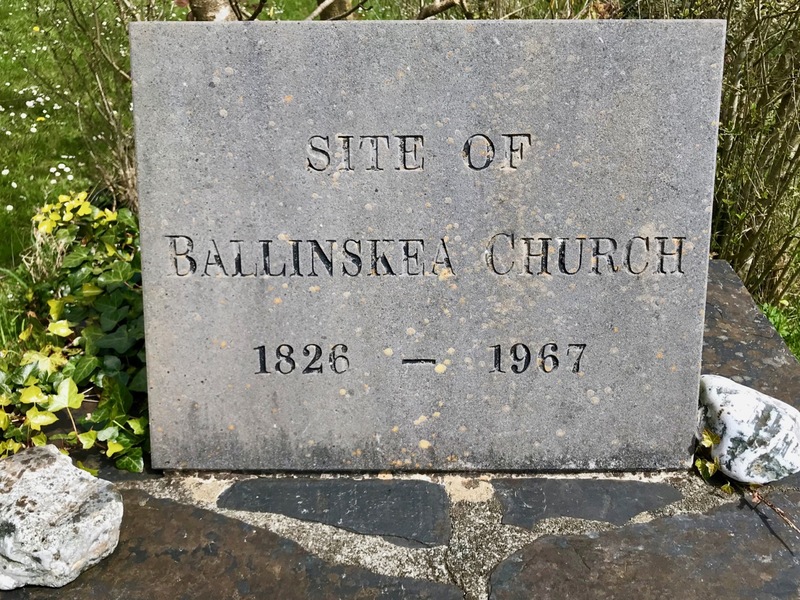 I hadn’t expected to find an old burial ground, the site of the original Ballinskea Church which existed in this remote area between 1826 and 1967, when the Church of the Seven Sacrements was built to replace it beside the main road at Lowertown. 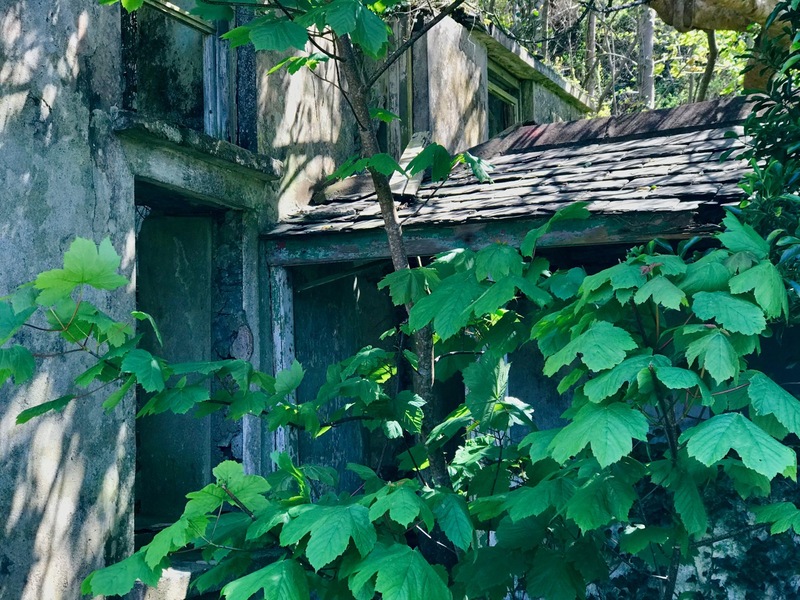 We passed a few houses along the way, but many were abandoned: each one tells its own story of lives and livelihoods – but they don’t readily give away their secrets to us. We were taken by surprise at the extent of the views both north and south from the higher ground. At one point we stopped to admire the long vista out over Dunmanus Bay with the Sheep’s Head settlement of Ahakista clearly delineated. After a good hour you will reach a gateway where you will leave the boreens behind and continue across country. 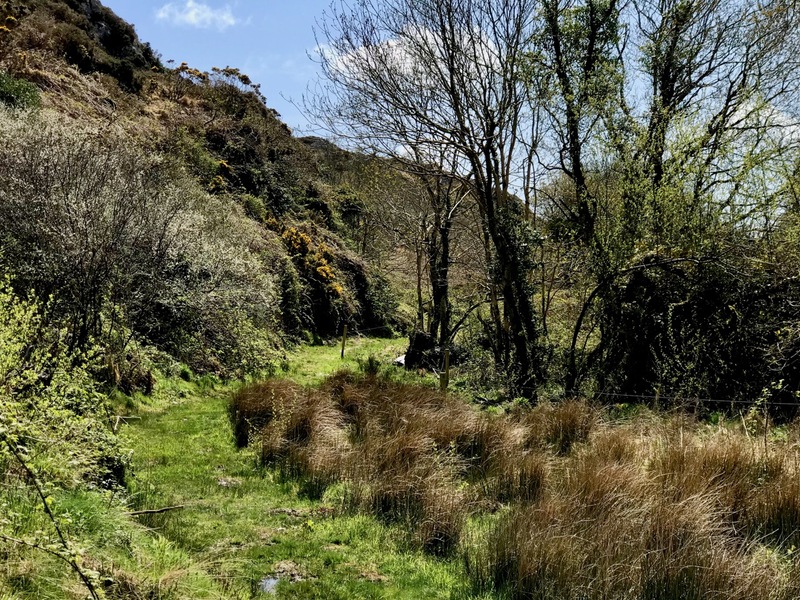 Of course, you don’t have to follow the marked trail: the myriad of tiny roadways continues throughout West Cork and is awaiting your further exploration. 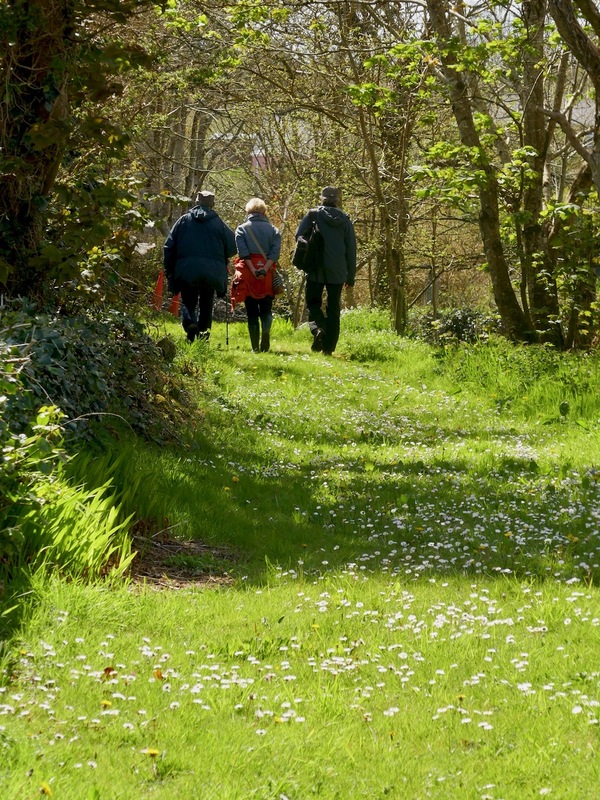 We did turn off, however, as the footpath beckoned through a leafy glen and looked most inviting. 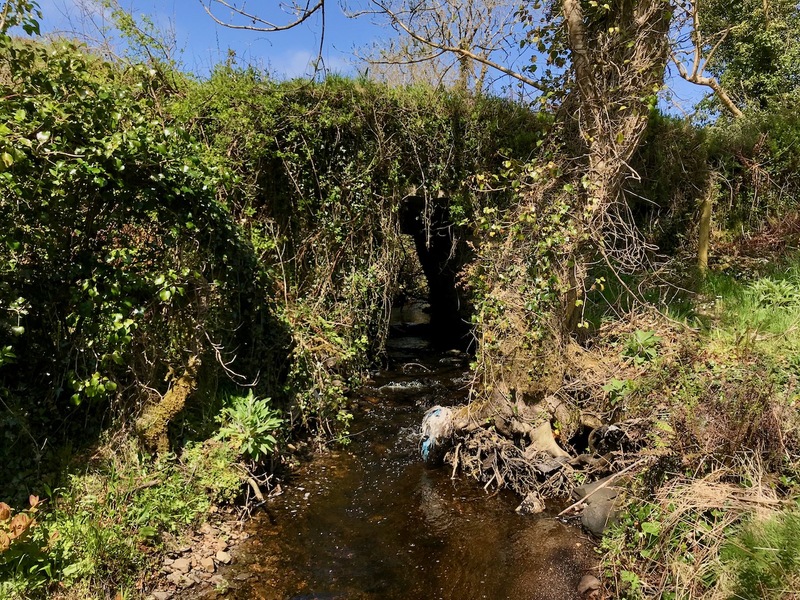 First of all, however, we paused to take a look at the bridge which carries the roadway over a stream that flows along by the path – and runs all the way down to Toormore Bay. The bridge is unusual in that it has a large stone slab lintol rather than an arch. 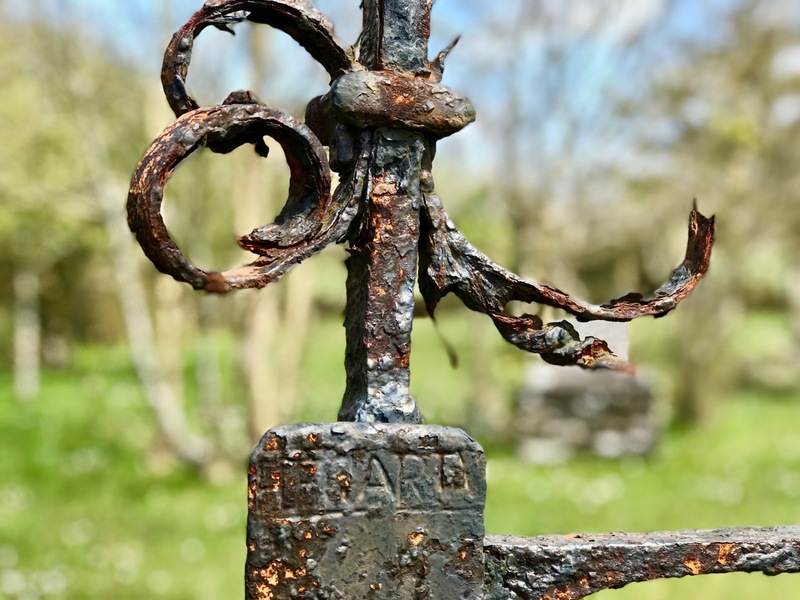 I don’t know its history for sure, but I would guess it dates from the eighteenth century, when the road it carries was established as the main highway from Goleen to Cork! 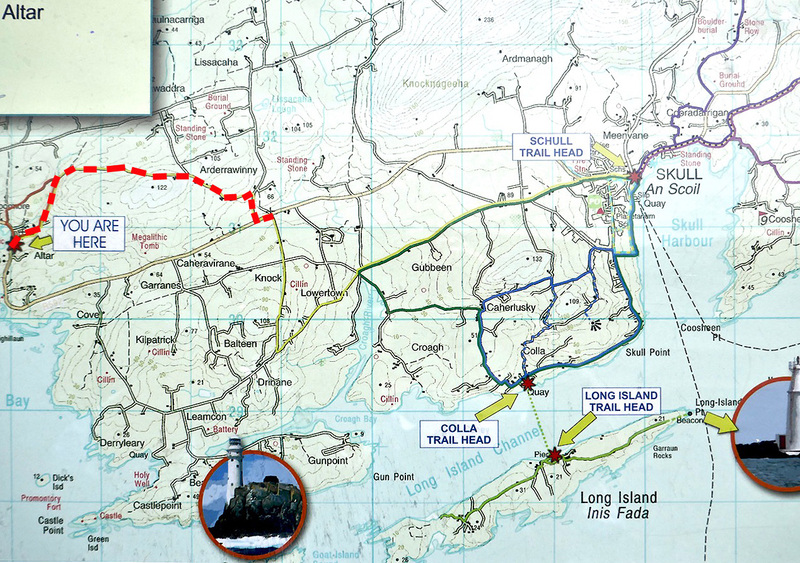 Our route is the line of the former Butter Road which ran all the way to the international Butter Market in Cork. 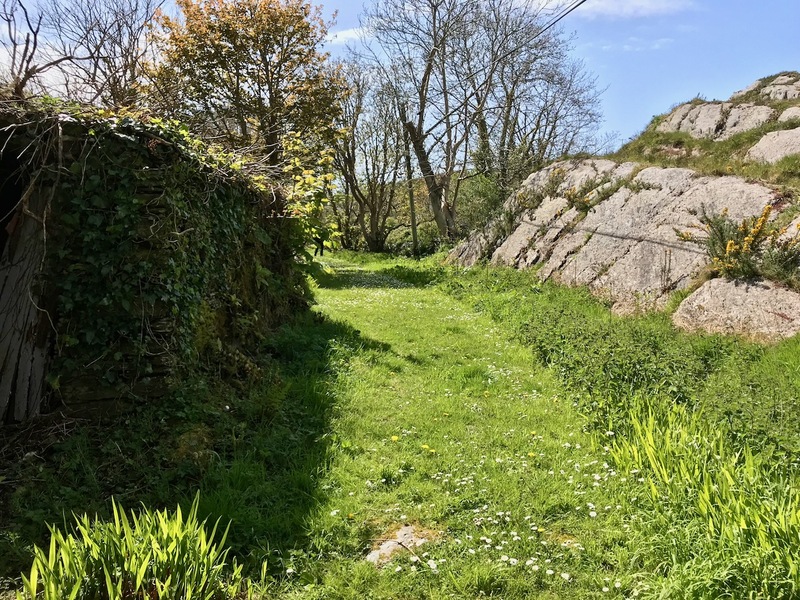 In its heyday it would have seen plenty of traffic in the form of packhorses and donkey carts, and some of the now abandoned cottages lining its way would have been welcome ports of call on the long trek. 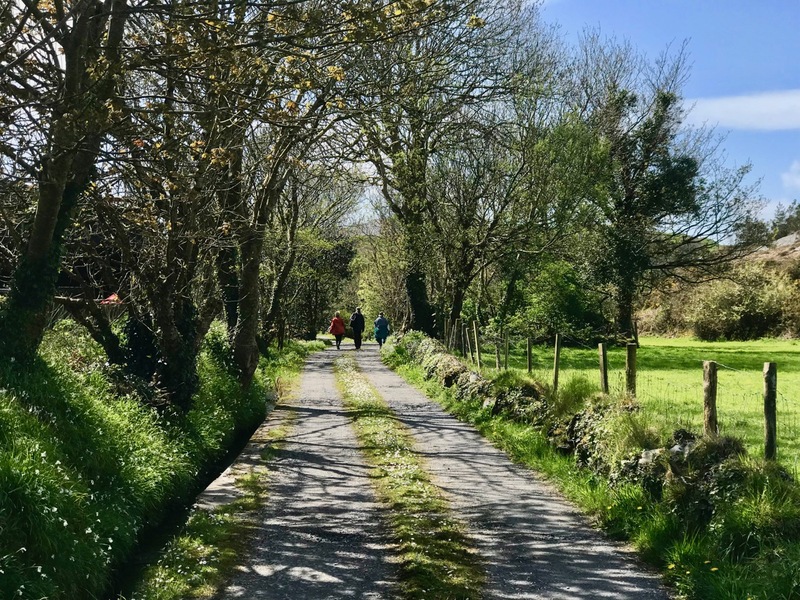 Here’s a post from Finola about a walk we did a few years ago on another part of this highway, which tells a little more about the great butter trading days. 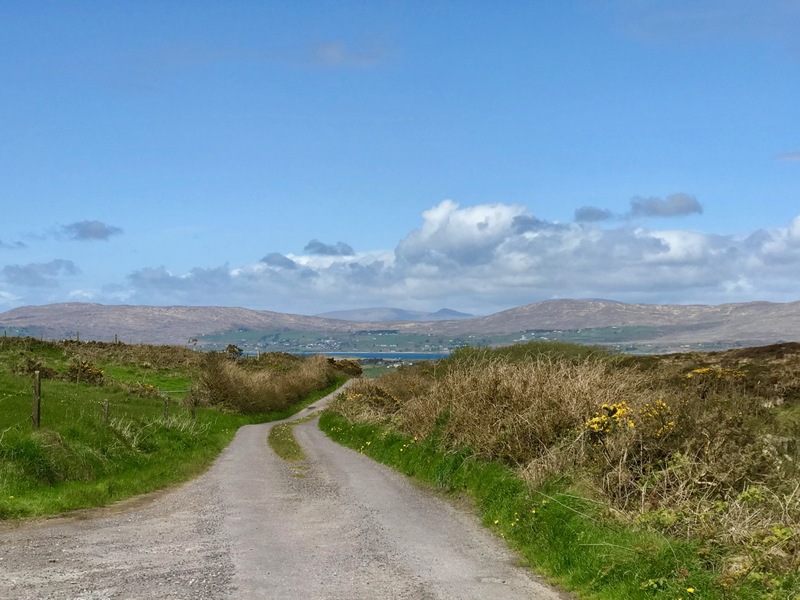 You can also have a look at my own post from last week, which talks about the improvements to the roads of West Cork initiated by Richard Griffiths a century later, at which time the importance of our own little trail receded and was bypassed by what is now the main road going from Ballydehob and Schull down to the end of the Mizen. 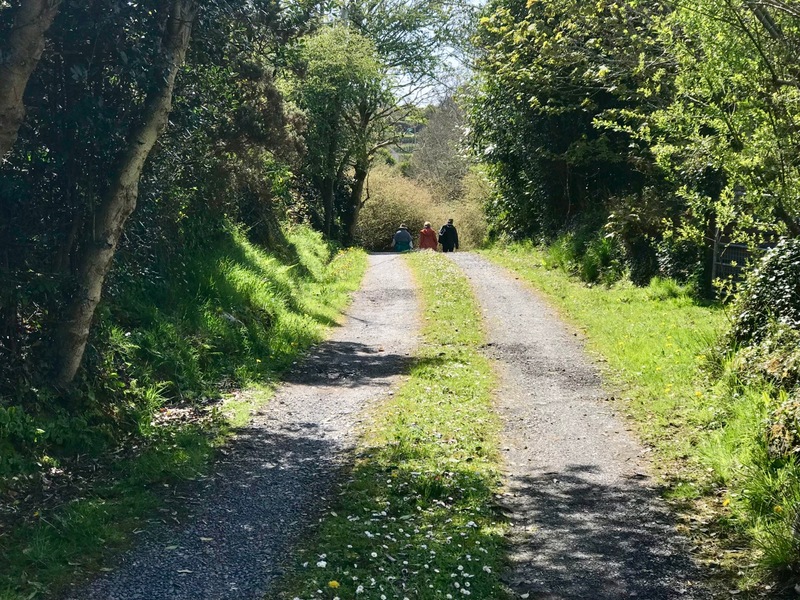 I suppose we therefore have Griffiths to thank for taking all the traffic away from our back roads and giving us these idyllic walking trails. 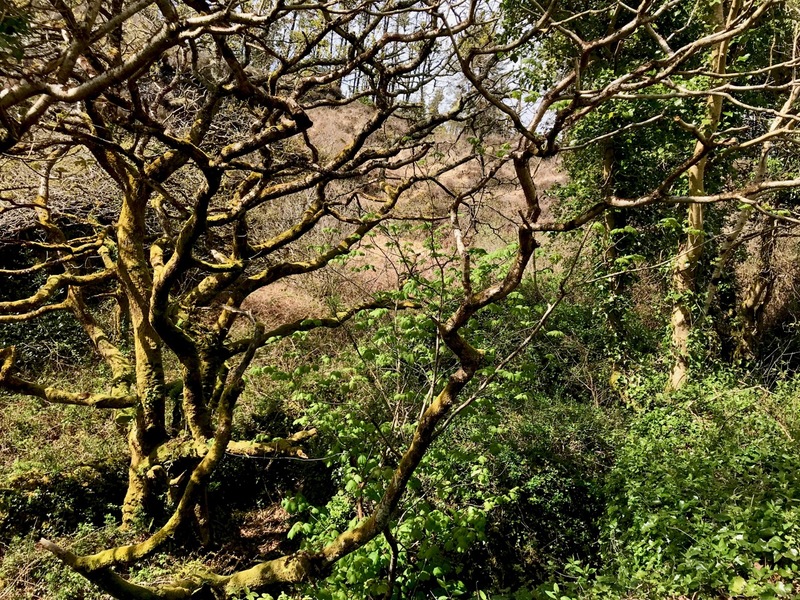 The footpath through the glen is another world – a contrast to the boreen we have been following so far. 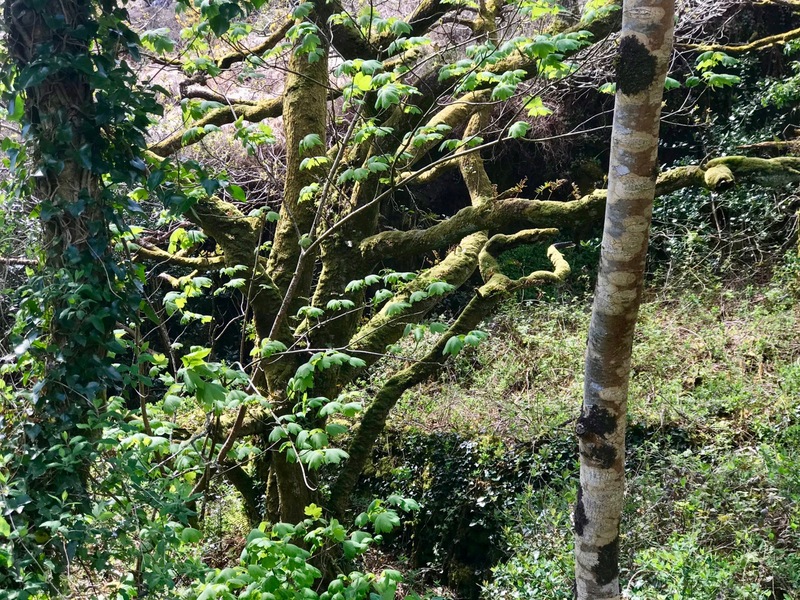 It is lush and damp underfoot, and there is green everywhere: mossy green boughs of ancient oaks, soft turf and vivid St Patrick’s Cabbage emerging in the newness of the late spring. All too soon we are in sight of our goal, the little church by the bay. But the good experiences of the day are not yet over. 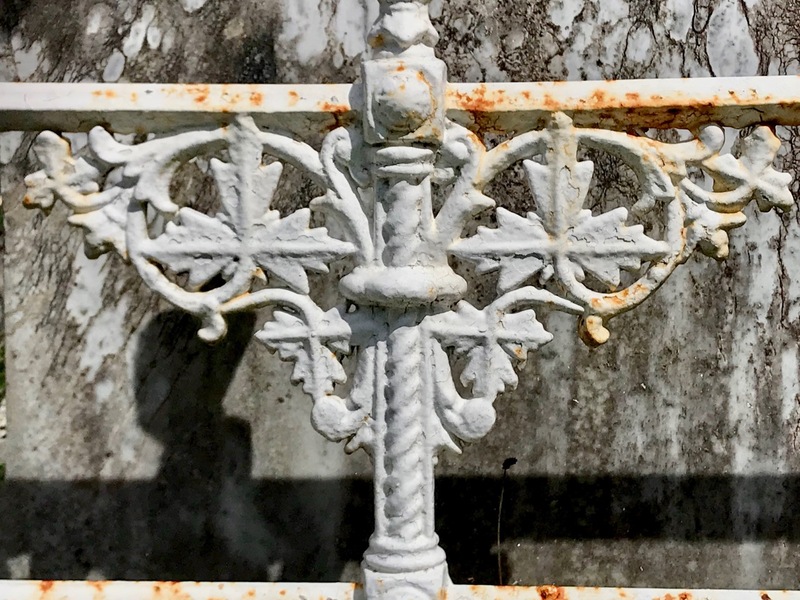 The church itself, and its burial ground, deserve exploration.
. . . Tradition has it that, in order to employ as many as possible, without benefiting the less impoverished farmers, no carts or horses were to be hired. The stone was quarried nearby and carried to the site entirely by hand. As Fisher wrote in a report on the church, ‘the employment was given chiefly by contract, so that the poor were able to work about their cabins, fishing etc. at the same time that they earned a subsistence for themselves.’ . . .
. . . It is a controversial building. 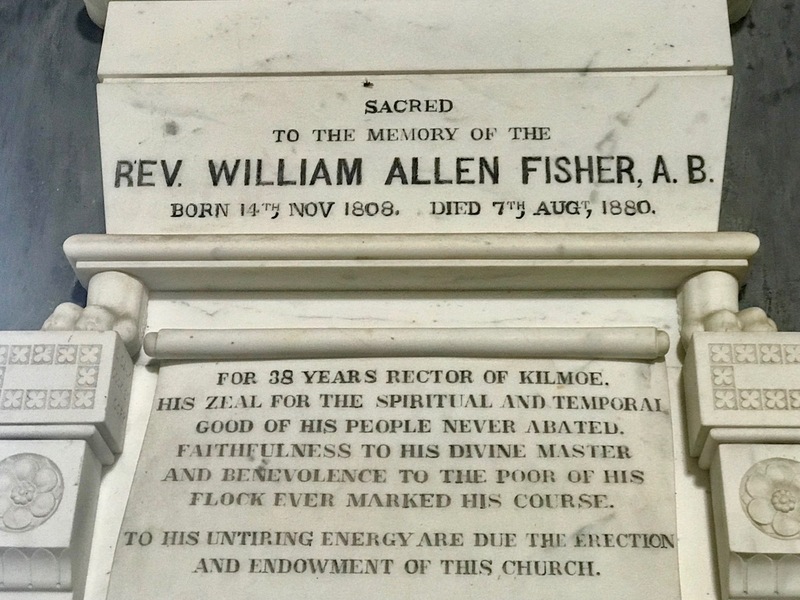 For many Protestants, William Fisher was a saint, a scholarly man happiest at his books, who nevertheless drudged selflessly for forty years in a remote parish, giving all his time and strength to the poor, the hungry and the sick, until he himself died of famine fever. 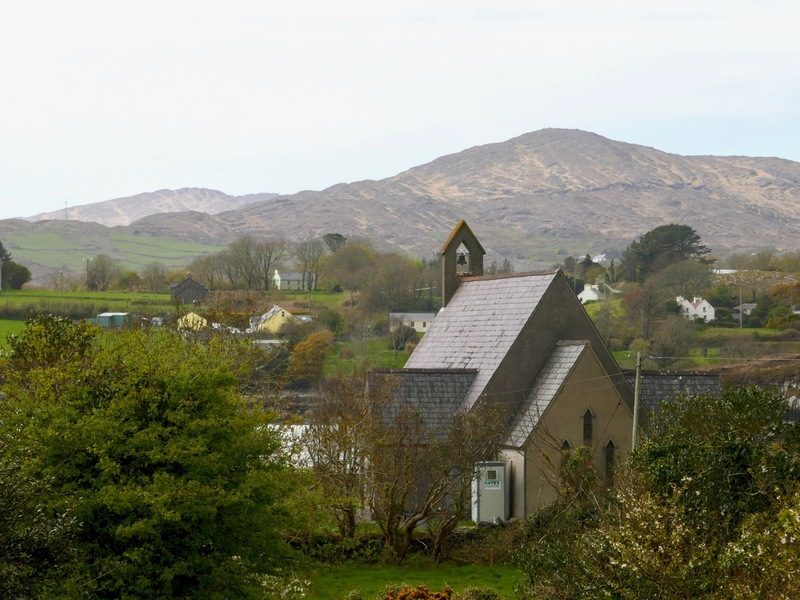 But for many Catholics, Fisher was a ‘souper’, whose manifold projects on the Mizen Peninsula, including the building of his church, had only one object: to win converts from Catholicism to the Church of Ireland . . . 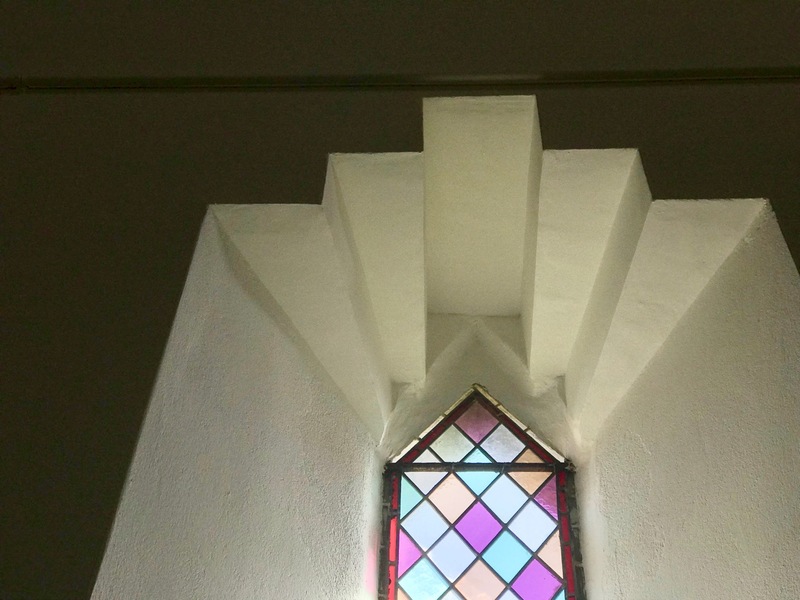 The church is not always open, so it is best to contact the Parish in advance for a look inside – it’s worth it for the history. This would be the end of the trail but we walked a little further, west of the church, and took the road up to the right. This intersects the Butter Road at a crossroads. 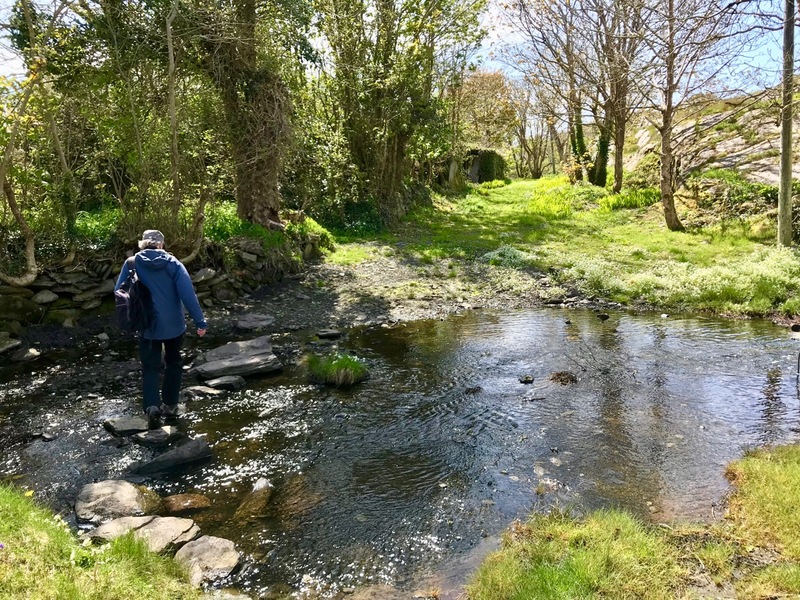 We turned left and found ourselves heading for another green track, followed by a ford with stepping stones. Keep going and you meet the main road again: if you are following the route it’s probably best to do as we did and retrace your steps here, rather than walk on the relatively busy main road. 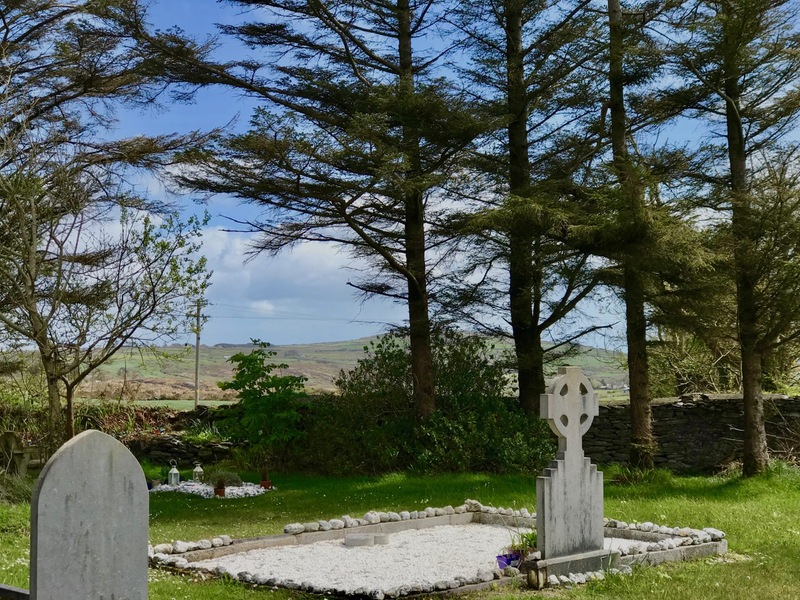 This entry was posted in Ahakista, Fastnet Trails, Graveyards and Headstones, Irish Heroes, Irish History, Mizen magic, Nature, Photography, Religion, Schull, The Mizen Peninsula, Toormore, Visiting Ireland, Walks, West Cork, West Cork Blog, Wild Atlantic Way and tagged Ballinskea Church, Butter Road, Butter Road Between Goleen and Schull, Church of the Poor, Church of the Seven Sacrements, Cork Butter Market, Fastnet Trails, Mizen magic, Packhorse Bridge, Rev William Allen Fisher, Sir Richard Griffith, Susan O'Toole Sculptor, Teampol na mBocht, Toormore Loop Walk, walking in Ireland. Bookmark the permalink. Great post Robert. 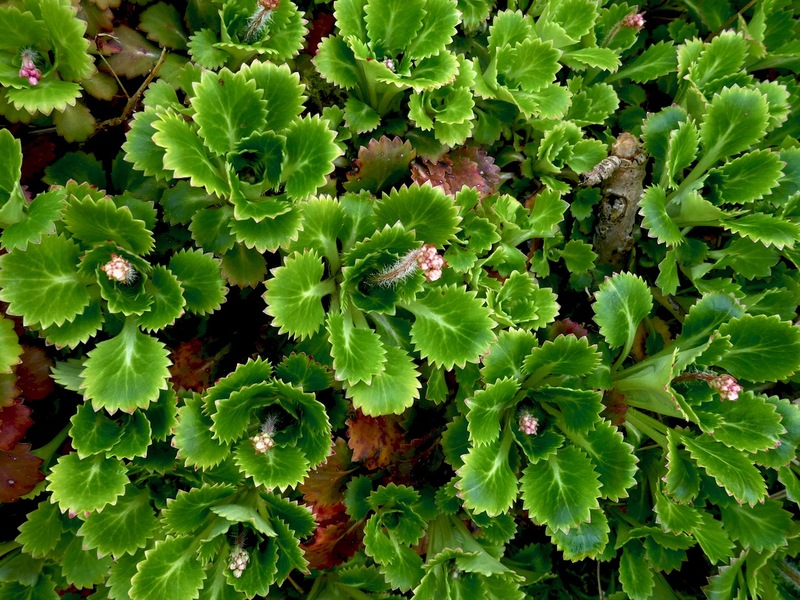 Truly you see, examine and report on things that the average visitor would hardly notice. 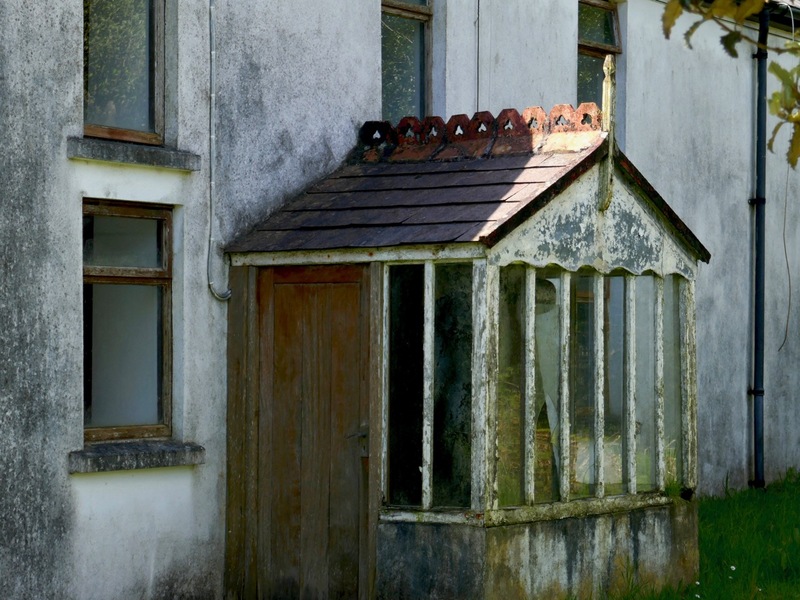 I’m always taken with abandoned houses and cottages. 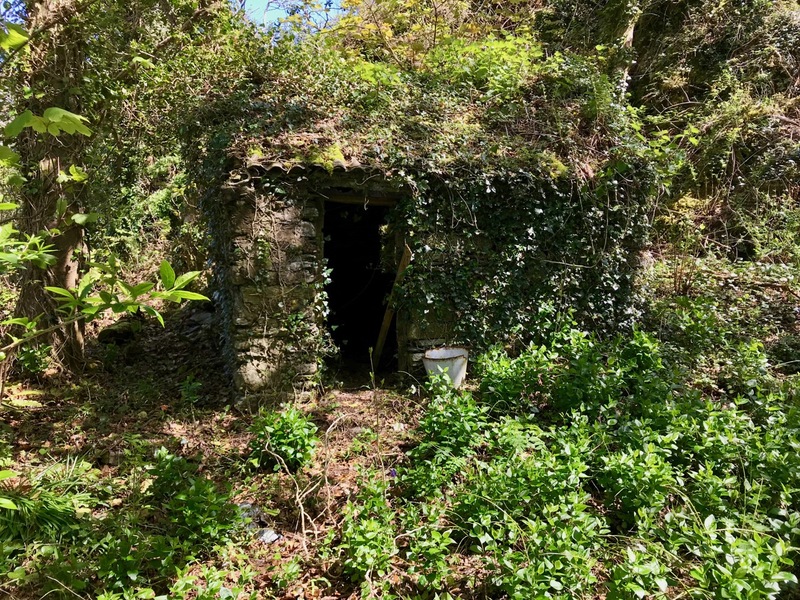 But at least in Ireland they are usually left to decay with grace, giving us the chance to wonder at those who went before us. 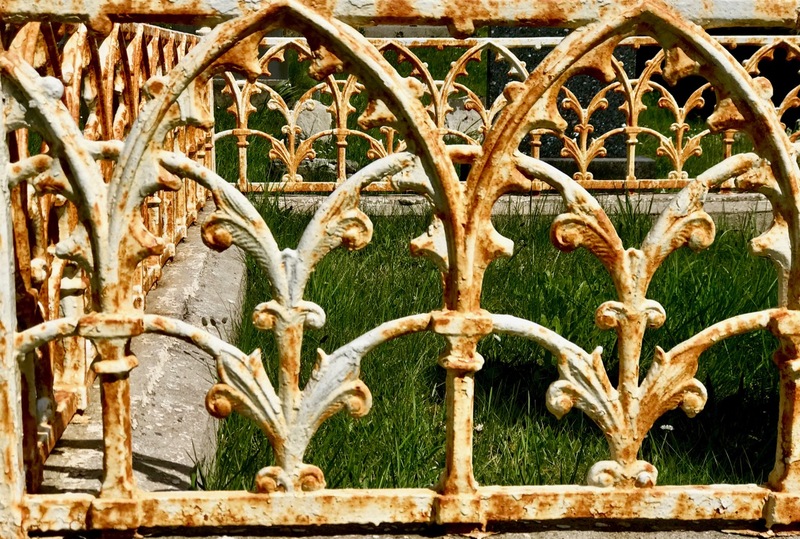 And that lintel bridge is wonderful, and could tell many a tale. Again I imagine it hardly attracts a passing glance from many. Very kind words, Roy – thank you. There’s always so much to explore! 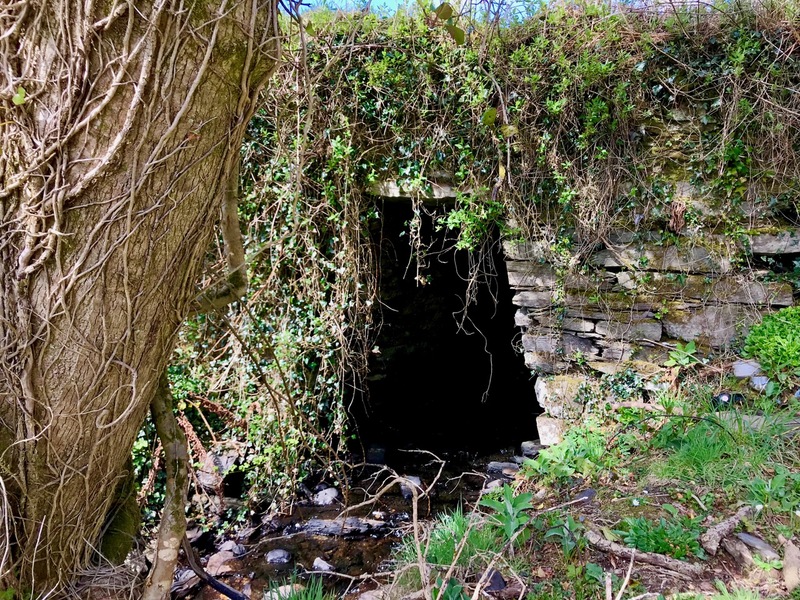 Another wonderful post about an area I pass regularly but haven’t really explored on foot. Looking forward already! Many thanks, Una. Well worth it – and worth taking some of the other boreens around there, too. 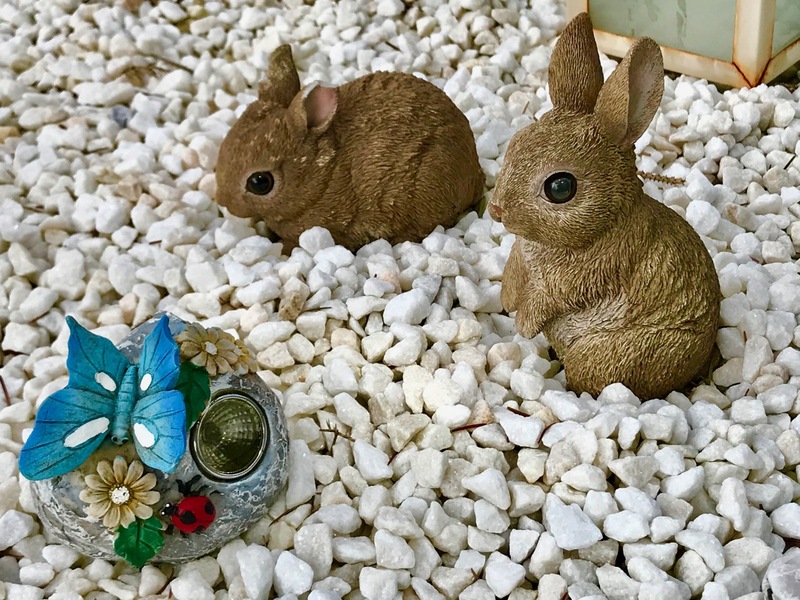 Enjoy it – hope you get some sunshine! 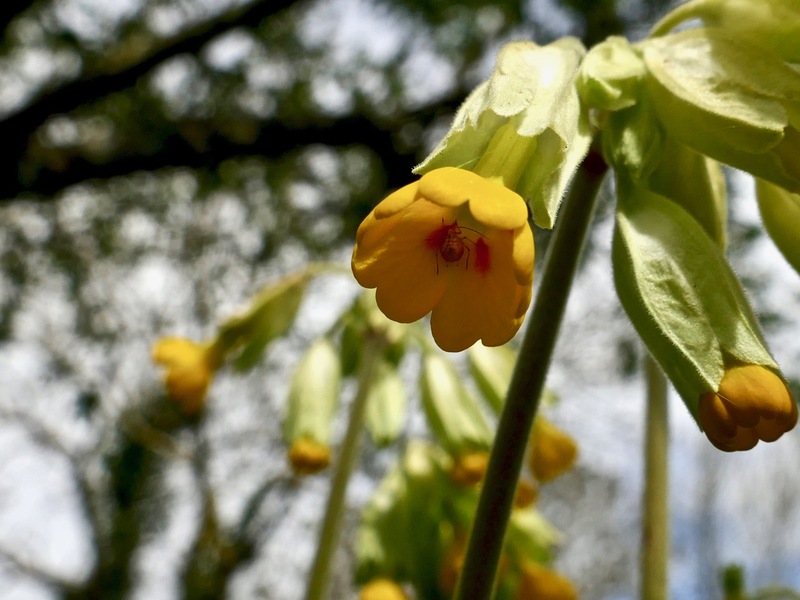 It was such an enjoyable day and so much to admire and look at – and just one or two wild flowers! !